Sometime before dawn, the cheerful warbling outside my bedroom window shifted my attention from the night’s worries, which seemed to be piling up like the week’s worth of dirty laundry in the corner of the bedroom. Naturally so, of course, because it’s Friday morning. I’ve had a week of learning (discovering as much about what I have not learned as what I need to learn). I’ve had a week’s worth of fascinating challenges that have tangled my wimpy neurons into a nest of nettles. I’ve designed a few solutions, noodled with some ideas, tried to sort this and that and turn the mess into thoughtful tactics. So maybe it’s natural that by the week’s end my wit’s end (if not reached) is certainly in view. I actually saw it, by the way (my wit’s end, that is). I’m pretty sure it’s right under that quivering twitchy spot just in front of my left temple. It is also natural that the mockingbirds are nonplussed by the thicket I’ve built in my head. They dash in and out of fabulous branches every day. The summer assemblages suddenly emerging from spring blossoms after this week’s rain have given my neighbor birds new complexities in every direction. In response, they do what birds do. They sing. So, on this sleep-deprived Friday morning, this Friday the 13th, this crazy full-moon Friday, nature demands celebration and calm. Wanting to cooperate (who’d pick a fight with Mother Nature? ), I’ve picked a cookie with soothing spices, tropical oil and three kinds of sugar. 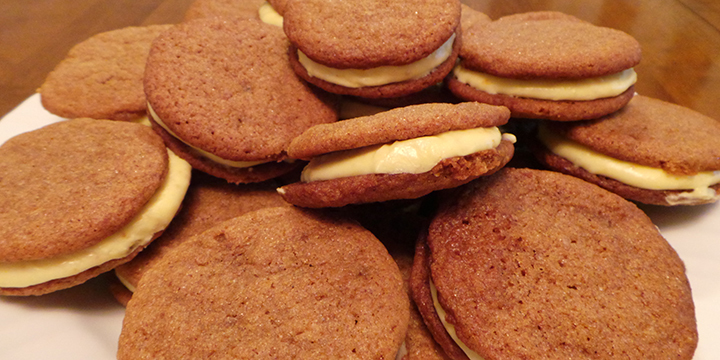 Ginger Sandwich Cookies with Lemon Cream. They are amaaaaaaazing! Seriously. They are messy and sweet and spicy, and they’ll make you wanna curl up in a rocker on the front porch where you and Kitty can watch those beautiful gray mockingbirds dance until the moon comes up.